Aliases: While still using the name August Masters, he posed as a psychiatrist at Carriwhite Acres, and as a government agent of the non-existent Central Intelligence Bureau (called CIB, then CID). History: (Captain America I#268 (fb)) - August Masters was a high ranking CIA agent that was recruited by Professor Power to join the Secret Empire, an organization intent on putting the world at war and then ruling the surviving societies. (Captain America I#264 (BTS) (fb)) - Masters was among the agents who backed Morgan McNeil Hardy's plot to use psychics to start a war with the Soviet Union. Morgan McNeil Hardy botched the operation, killing two of his psychics and seemingly killing himself. The other two psychics, Ursula Richards and Philip le Guin, survived. (Defenders I#102 (fb)) - Assigned by the Secret Empire, Masters set up a false psychiatric center called Carriwhite Acres (whose previous owner had been an Empire operative). Masters pretended to be the head psychiatrist. He ran the staff there, including Nurse Ratchid, King, and Torrance. He then began gathering patients who showed some psychic abilities, in order to prepare the patients to launch the war. When Mindy Williams was put into their center by Kyle Richmond (Nighthawk of the Defenders), Masters realized that Mindy was the strongest telepath there despite the fact that she was mentally ill. He began strapping all the psychics to a machine and feeding their energies into Mindy, who he began training to use the powers. Mindy lashed out once and sent out a wave in a rage that ended up paralyzing Richmond. (Defenders I#102) - When Richmond came to visit Mindy, Masters introduced himself and gave Richmond a brief tour of the estates. When Mindy saw Richmond, she grew upset, and Masters asked Richmond to leave. When Richmond returned as Nighthawk that evening (not paralyzed at night), he was met by armed orderlies, who he quickly defeated. Masters approached Nighthawk and told him that Carriwhite Acres was a front for a government branch called the Central Information Bureau (CIB). He then showed Nighthawk where the telepathic tests were done, and Nighthawk punched Masters in the face, shattering his glasses. Masters had the technicians attack Richmond through a psychic attack of rats (focused through Mindy). Mindy was able to break free, though, and attacked Masters' staff, killing some and devastating his entire operation. Richmond threatened to go the papers with the whole thing and took Mindy with him, but Masters was able to stop the story from being printed. (Thunderbolts I#33 (fb)) - August Masters took a private army (dressed like Roman soldiers) and set up shop in Mt. Charteris, in Burton Canyon, Colorado. (Captain America I#268 (fb)) - Masters saw to it that more psychics were gathered to Mt. Charteris, including Mindy. He had Ursula Richards and Philip le Guin retaken by force, and more psychics were found. Mindy, their most powerful psychic, was severely mentally unstable, and Masters realized that Richmond would be needed in order to help stabilize her. (Defenders I#103) - Masters saw to it that Richmond's legal troubles were taken care of. After Richmond heard the news, Masters appeared before him, bragging of his involvement in Richmond's life. (Defenders I#104 (BTS)) - Masters sent operative Hanson and a group of soldiers to pose as CIB agents in order to bring in Nighthawk. Hanson gassed Richmond, Gargoyle, Hellcat, and Valkyrie and returned them to Masters at Mt. Charteris. (Captain America I#268) - Holding the four heroes as unconcscious captives at Mt. Charteris, Masters had Nighthawk revived and placed in a wheelchair. Masters admitted to Nighthawk that the CID (formerly called CIB) did not really exist. He brought Nighthawk to Mindy Williams and told him to keep her calm so that she would not lash out in another psychic assault, and that he would kill the other heroes if Nighthawk didn't comply. When Captain America arrived, Masters greeted him and escorted him through the complex until Captain America punched Masters in the jaw. The alarms then went off, signifying that Gargoyle, Hellcat, and Valkyrie had escaped, causing Masters to fear the Professor's wrath. After the heroes battled many Empire operatives, Masters convinced Captain America to surrender when Masters threatened to self-destruct the base, killing the heroes and telepaths with it. Masters laughed with scorn when Captain America kept his word and allowed himself to be captured with the other heroes. Masters drugged all the heroes except Nighthawk, then went off to reformulate his plans. (Defenders I#106) - Masters recounted the history of the psychic war plan to Richmond, and showed Richmond the captive heroes. Masters estimated that within three hours, the brains of every person in the Soviet Union would be destroyed. A security breach led Masters to discover that Doctor Strange, Daredevil, Beast, and Son of Satan had snuck into the base posing as Roman soldiers. Perhaps rushing to start the war before the heroes could stop him, Masters was shocked to find Richmond at the control base. Richmond was possessed by the combined mind of six of the psychics who wanted to stop Masters, and they had Richmond initiate a self-destruct sequence for the entire base. Richmond held Masters there and allowed the heroes to escape. The whole base exploded, killing all within it. (Defenders I#115 (fb)) - The six psychics found themselves fused into a single being as the explosion went off. With their newfound power, the Mindy part of the being sought to save Richmond from death by shunting him across the dimensions, but in their haste they accidentally saved August Masters instead. (Defenders I#113 (fb)) - Masters found himself materializing on the parallel Earth-S, home of the Squadron Supreme. There, he found a world where the goals of the Secret Empire had come to fruition through other villains: America had conquered the world, and communism was obliterated. Masters was shocked, however, to find despair and repression in the minds of people instead of the hope and freedom he'd expected. He also discovered that an alternate version of Kyle Richmond was the President. Driven slightly mad by these circumstances, Masters developed a plan to infiltrate America's Moon-Base, and to assassinate Richmond, the man he now held responsible for his circumstances. (Defenders I#112) - Masters ran from men who were pursuing him for an unknown reason. He shot and killed one of them, then searched the body (possibly taking its ID). (Defenders I#113) - Now on the moon, Masters searched until he found Pres. Richmond. Nearby, several Earth heroes (Beast, Doctor Strange, Gargoyle, Nighthawk, Scarlet Witch, Silver Surfer, Son of Satan, Sub-Mariner, Vision, and Valkyrie) and the Squadron Supreme were battling Overmind. Masters shot and killed Richmond. Masters was shocked to realize, though, that 'Richmond' had only been a biological construct for Null the Living Darkness to live in, and Masters had set Null free. (Defenders I#114) - Going more and more mad, Masters watched as the Defenders, the Squadron, and the reformed Chorus (formerly Psychics) battled Null. Masters uncovered the corpse of Richmond only to see it withering away, not a human body after all but some artificial construct. At the battles' end, the Psychics took over the Overmind's form. (Defenders I#115) - Masters heard the Chorus explain how he'd survived to the assembled heroes. He then accompanied them back to Earth-616, muttering to himself in a form of extreme shock. Comments: Created by Steve Gerber, Sal Buscema, and Jim Mooney. The fate of August Masters is unknown. It's likely that he is interned in some sort of mental health center, based on his last appearances. Omar Karindu notes that Nurse Ratchid is a reference to the novel and film "One Flew Over the Cuckoo's Nest." Likewise, his underlings Brodsky and Wein are references to Marvel creators Sol Brodsky and Len Wein. Per Degaton further added that Nurse Ratchid, King and Torrence are all references connected to Jack Nicholson. King was a reference to Stephen King the author of "Shining". In the first movie based on this novel Jack Nicholson played the character of Jack Torrance. Ursula Richards and Philip LeGuin were a reference to Ursula LeGuin the author of "Lathe of Heaven". Madison Carter added to this that "The Shining" and "Lathe of Heaven" both dealt with characters with some mental powers. Ronaldson was a Secret Empire operative that dressed as a Roman soldier and was stationed at Mt. Charteris in Burton Canyon, Colorado. He was set to guard the telepath, Mindy Williams. When August Masters brought Nighthawk to see Mindy, Masters told Ronaldson not to get trigger happy. Nurse Ratchid, King, and Torrance were among the Secret Empire employees working for August Masters at Carriwhite Acres. They helped tend to Mindy Williams and other psychics that were being used to prepare a war with the Soviet Union. When Kyle Richmond came to investigate, Masters had Nurse Ratchid and King help Richmond meet up with Mindy. When Richmond came back as Nighthawk that evening, Torrance sent guards to apprehend him. Later that night, Mindy lashed out with a psychic assault that destroyed the Carriwhite operations, killing some of the operatives there. 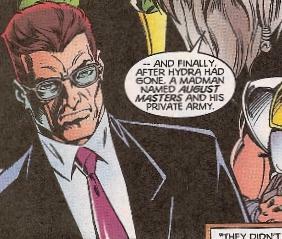 Hanson was an operative of the Secret Empire who worked with August Masters. Hanson was sent in with a group of men, posing as government CIB agents, to apprehend Kyle Richmond, the Defender known as Nighthawk. Hanson interrupted a party Richmond was holding. When Richmond's teammates, Gargoyle, Hellcat, and Valkyrie, prepared to battle, Hanson's agents fired gas guns in the room, knocking everyone unconscious. Hanson took the four Defenders captive, and returned them to Masters. Brodsky was the section leader for a group of Roman-clad Secret Empire operatives based at Mt. Charteris in Burton Canyon, Colorado. When an attack was felt on the surface, Brodsky sent Berger, Kowalski, Wein, and another operative to investigate, but they found nothing. While Brodsky and August Masters questioned the soldiers, Brodsky noted that there were too many of them there, and initiated a roll call. It was soon discovered that Doctor Strange, Daredevil, Beast, and Son of Satan were there posing as soldiers, and the Beast engaged in battle with them. In a later attack, the Empire base self-destructed.